Each reproduction m1940 Dog Tag Chain is hand-made to exacting wartime standards. 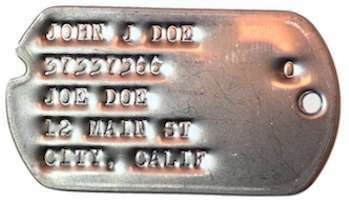 This is the chain that was issued to the troops from 1940 to 1943. 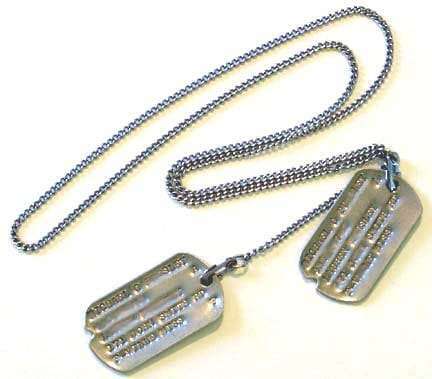 Each Reproduction m1940 Dog Tag Chain is hand-made to exacting wartime standards. 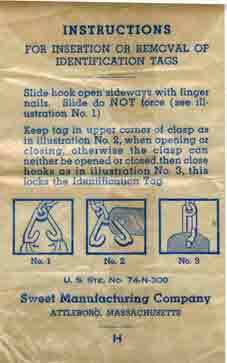 Prior to 1940, a mono-filament chord was issued to hold the tags, from 1940 to 1943 this was the chain issued to the troops. The beaded chain was available at the PX for purchase and was very popular. 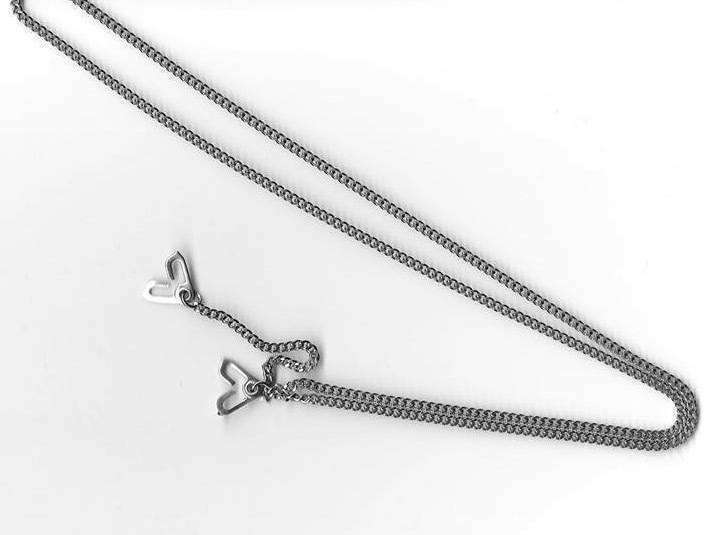 After 1944, the beaded chain was issued. Just like original chain.Now I can wear my dads dog tags instead of carrying in my pocket.Thanks. Thanks chain is so authentic looking, looks just like my dad’s original chain. Great product with top of the line craftsmanship. Outstanding product and customer service. This is a near museum-quality item, great for display or to wear. Great item! Good job! Fantastic, high quality reproduction. Beautiful. WHY ARE YOU OUT OF STOCK??? I NEED 12 OF THESE. Judy, We have the chains on back order. Please email us and we’ll let you know as soon as they arrive. Excellent product, just as advertised. Excellent product with great attention to detail. Thank you, I’ve been looking for a chain for my Dads WWII Dog Tags. This chain is perfect. I love it. Service was very fast received in 3 days. I couldn’t be more happy. Perfect. Great quality and extremely authentic. Couldn’t be happier with this purchase! Been looking forward to my dog tag chain for awhile now. However, it didn’t show up. Outstanding product the m1940 chain feels better overall then wearing the regular bead chain. Extremely happy with this chain. I ordered it and the beaded chain. Tags hang better on this chain. They lay flat and the chain adds a really good look to my impression. This is a very accurate reproduction that is very comfortable to wear. High quality with very good materials. Perfect in every way. I couldn’t be more pleased. Many Thanks. Got my grandfathers dog tags and this is perfect. The chain is comfortable and the clasps are built sturdy although stiff. If I ever needed another i know where to come. Exactly what I was looking for!!!! Just received my set. The chain looks great with my Dad’s 1943 issue DT’s. Thanks for making these available. I had lots of questions and an incomplete service record to go by and Lance was extremely helpful. Received the tags and can’t wait to give them as Christmas gifts. It was a pleasure doing business with this company. I lost my grandfather’s real WWII dog tag because I had it on a ball chain that broke. My cousin who got the other tag, got the original chain, needless to say he did not lose his. I’ve got replacements now, and with this chain, I’m not worried about loosing them this time. Well built. Great construction Shipped quick. This chain is almost like the original silver version. However, the “nubbins” on the hooks stick out farther than on the original silver version. 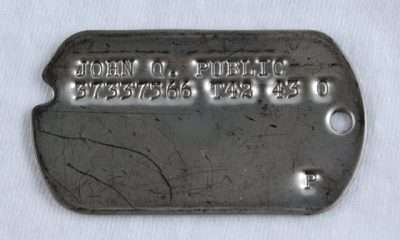 Dog tag cannot hang straight because of these larger “nubbins.” Other than that, it is a good reproduction. Excellent quality and attention to details. Love them! 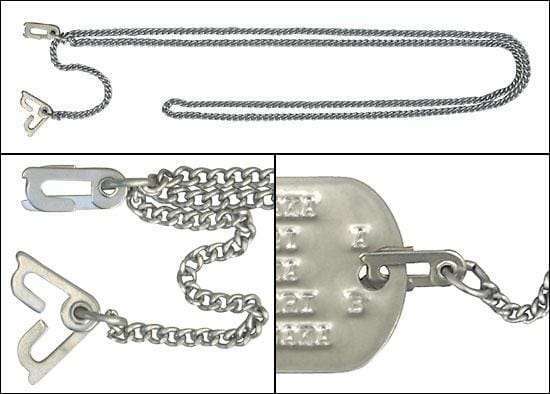 These dog tag chains look just like the original WWII chains. Awesome! Great product though I shortened both chains. Now I can wear my dog tag and as a tribute to my father, my dad’s dog tag fm WWII. Great quality and a sharp looking product. Only problem is that my P1940 Navy tags don’t fit. Not your fault. Had a set of original AAF tags from my Grandad that fit. Went on like they were born to do it. Going to order ball and chain from you for the P1940 set. Guess the Navy didn’t get the good chains for theirs. The ball and chain will be better than the white HBT issued. Pretty sure my grandfather would have upgraded from the white string in the day. Wonderful way to wear those tags! I think it is much better than the ball chain issued. A very quality chain,very comfortable and sturdy, thanks WW2 Dog Tags !! Great reproduction of the early chain. Although I’m a living hisotrian, I bought these for my mother who never saw her dad’s WWII dog tags. They fit the bill and moved emotions. Thanks WWII Dog Tags! Outstanding Repro ! The chain is heavier than the original I have, otherwise an exact copy ! Just like the original set that I have. Thanks for setting up a set of dog tags like the originals my Uncle Mike wore on D Day. I buried a set on the beach at Normandy…he always thought of the boys that didn’t come home. He always wanted to go back, but could never afford the trip. I feel I left a tribute to him buried on Omaha Beach. He was in the second wave of troops that landed, he was an MP attached to the 5th Engineers Special Brigade. Thanks! Finally a great reproduction for a rare chain. Good sturdy product. Nicely made and authentic looking. 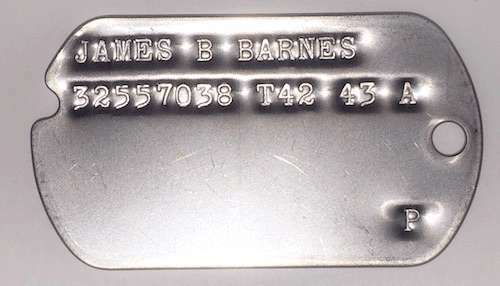 I plan to use it to wear my dad’s tags to the next event.